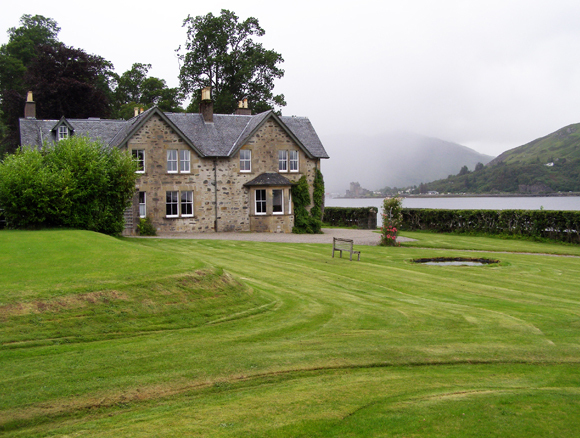 Druidaig and Beolary Estates offer west coast stalking over 6,000 acres in stunning scenery. The Estates lie on the south side of Loch Duich overlooking Eilean Donan Castle and the Five Sisters of Kintail. On good days it is possible to look out west to the islands of Rhum, Eigg and Muck. Although this is rugged west coast scenery at its best, Druidaig is not as steep as its neighbours. Stalking for 1 rifle and sometimes 2 will be available in September and October with an expectation of approximately 3 stags per week during September and possibility of 6 stags during October. Druidaig Lodge lies in a superb position on the southern shores of Loch Duich with views across the loch and to the Five Sisters of Kintail from most of the windows. The area fully justifies its reputation as one of outstanding natural beauty. The lodge lies in 5 acres with two small trout streams running through the grounds. The Lodge, built in 1912, has recently been totally redecorated and includes a drawing room with open fire and colour tv, dining room with open fire, games room with full sized billiard table, large kitchen with 4 oven Aga, and two w.c.’s. Upstairs there are 7 bedrooms, 3 twin bedded rooms, 1 double bedroom, 2 single bedrooms and a bunk room. There are three bathrooms and two w.c.’s and two of the twin rooms have wash hand basins. There is also an attic with 1 bedroom and 3 beds and 2 single rooms ideally suited for children.